Camille Hoffman's current work is a mixed-media meditation on Manifest Destiny and its representation in the romantic American landscape. Reflecting on the embedded and latent meanings around light, nature, the frontier, borders, race, gender and power in influential American landscape paintings of the 19th century, she uses materials collected from her everyday life, including holiday-themed tablecloths, discarded medical records, nature calendars, plastic bags and paint, to craft imaginary landscapes that are grounded in accumulation, personal narrative and historical critique. Her paintings and installations are layered geographies, in which these fragments of cultural objects are chromatically twisted and blended into complex wholes. Taking inspiration from the Philippine weaving and the Jewish folk traditions of her ancestors, along with traditional landscape painting techniques from her academic training, she interweaves image with refuse in order to reveal seamless yet textured transcultural contradictions. Disrupting visual perception, her scraps of materials take on new life, becoming a vehicle of territorial reclamation and spiritual agency for the artist amid the pressures of economic and political globalization in the anthropocene. Camille Hoffman (b. 1987, Chicago, IL) earned an MFA from Yale University (2015), a BFA from California College of the Arts (2009), and was a recipient of the Carol Schlosberg Memorial Prize for excellence in painting from Yale University, a National Endowment for the Arts scholarship, a Benjamin A. Gilman International Scholarship for research in Spain, and the Van Lier Fellowship from the Museum of Arts and Design (MAD). 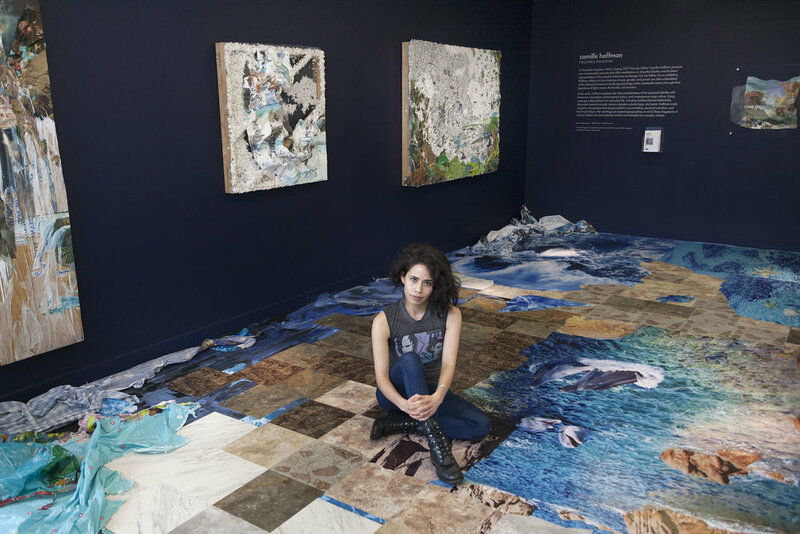 She has exhibited her work throughout the United States and in Europe, in exhibitions and venues including Pieceable Kingdom at the Museum of Arts and Design, New York, NY (2018), Rockabye My Bedrock Bones at False Flag Projects, Long Island City, NY (2018), Lincoln Center, New York, NY (2017), Times Square, New York, NY (2017), Yale University Art Gallery, New Haven, CT (2015), Nuit Blanche arts festival, Paris, France (2015), and Espai Cultural Biblioteca Azorín, Valencia, Spain (2008). Current exhibitions include Excelsior: Ever Upward, Ever Afloat at the Queens Museum (through fall 2019). Hoffman has been an artist-in-residence in numerous programs including the Children's Museum of Manhattan, New York, NY (2018), Bronx Museum Artist in the Marketplace, Bronx, NY (2018), Wave Hill, Bronx, NY (2018), QueenSpace, Long Island City, NY (2016-17), Museum of Arts and Design, New York, NY (2017), and Cooperative Arts and Humanities High School through the Yale University Office of New Haven and State Affairs, New Haven, CT (2015). Hoffman has also worked for over a decade as an arts educator and community organizer in Phoenix, the San Francisco Bay Area, New Haven, Brooklyn, and Queens. She currently lives and works in New York, NY.